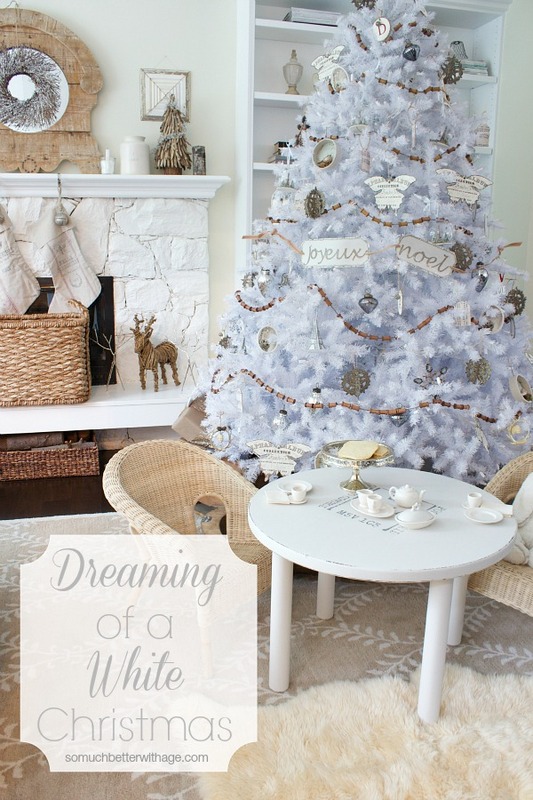 This year I am taking part of the Balsam Hill Christmas tree blogger tour and I was dreaming of a white Christmas tree! 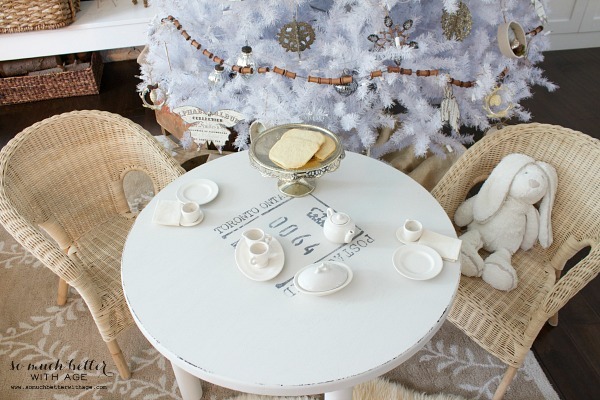 I’m so excited to be a part of Balsam Hill’s 2nd Annual 12 Bloggers of Christmas this year! When I was invited for this tour, the first thing I said to myself was, I hope they have a WHITE tree! 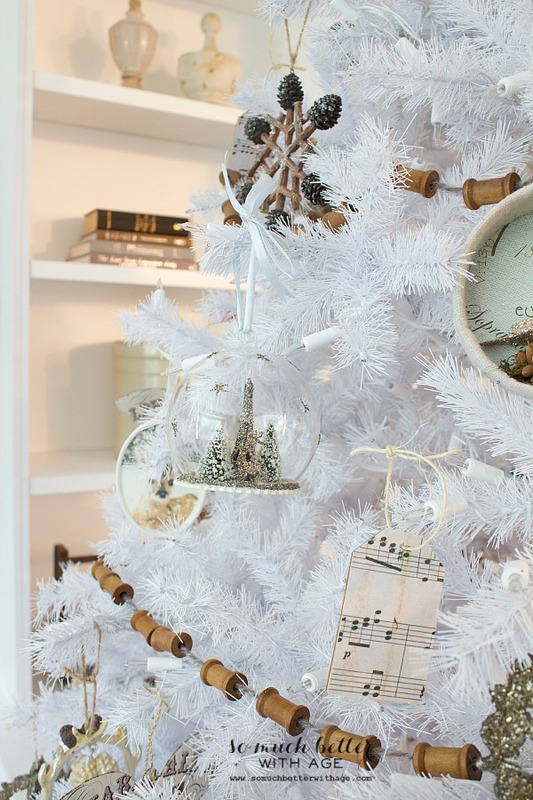 I know a white Christmas tree isn’t the first thing you think of when you think of a Christmas tree but I am in LOVE with whites and neutrals. I’ve wanted a white tree for years. So let’s begin the tour of the 12 Bloggers of Christmas. And of course, I’ve been dreaming of a White Christmas. Disclosure: I received this beautiful tree from Balsam Hill. All opinions are 100% my own. For your convenience, affiliate links are added. Please read my disclosure policy. It’s been a lot of fun to decorate for the holidays this year. 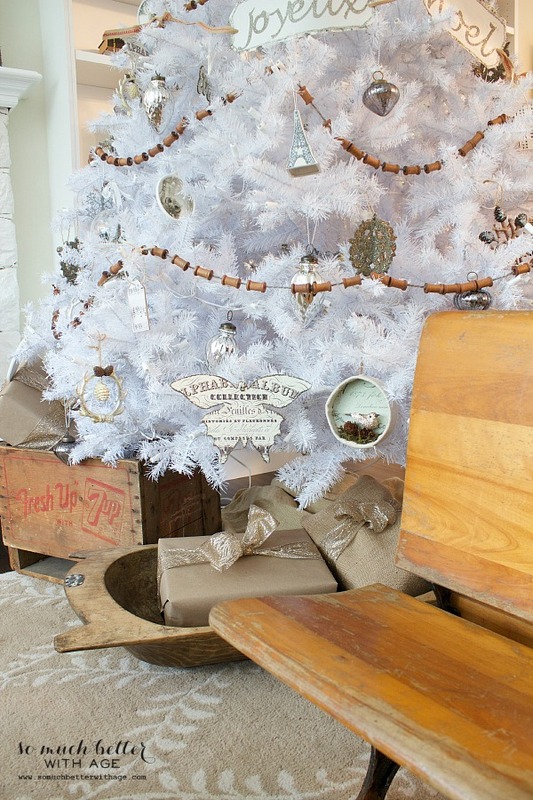 When I received this beautiful Pikes Peak Christmas tree from Balsam Hill , I got all giddy. I already received my Christmas present! I was worried that my neutral ornaments wouldn’t be noticeable on it, however I was wrong. You could put anything on that tree and it would be gorgeous! My daughter loved the little tea party I made up for her today. Recently I painted this little table and can’t wait to show you the before and after photos soon. I used this stencil and Champlain paint from Fusion Mineral Paint. This tree is 7.5 feet tall and the clear lights are so bright! I love how it illuminates the room. I took so many photos of my home for Jennifer Rizzo’s Holiday Housewalk. About 500! 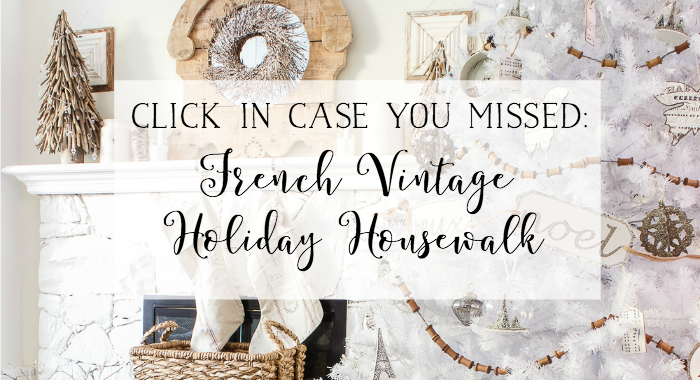 I recently shared the details of the ornaments on my tree along with other French decor details. Those old school desks were an awesome little find on a recent junking day. It’s so pretty I wish I could keep it up all year round. 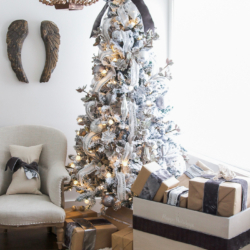 I love that I can start decorating early with a faux tree! The Yellow Cape Cod | So Much Better With Age — that’s me! I’m so glad you chose to put it in your living room – it looks perfect there! Awww, thanks Tara! Doesn’t it look so good here? What was I think taking it up to the not-so-rustic cabin?? Glad you talked me out of that one! Absolutely gorgeous tree, especially when lit up. It really highlights the beautiful decorations. Thanks for sharing. Thanks so much, Nettie. It’s amazing when it’s lit up, can’t believe how bright it is. Aww, thanks Angela. I love it. I’m so glad I went for it. 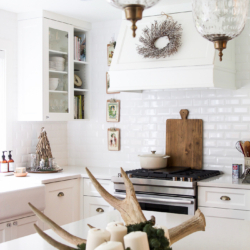 I love white trees – I have one in my kitchen! Simply stunning! Ooh a white one in the kitchen would be amazing! Thanks Nancy! I love gold too…oooh that would look nice on my white tree. Did I just noticed on your Google account you are from Vancouver, BC too?? 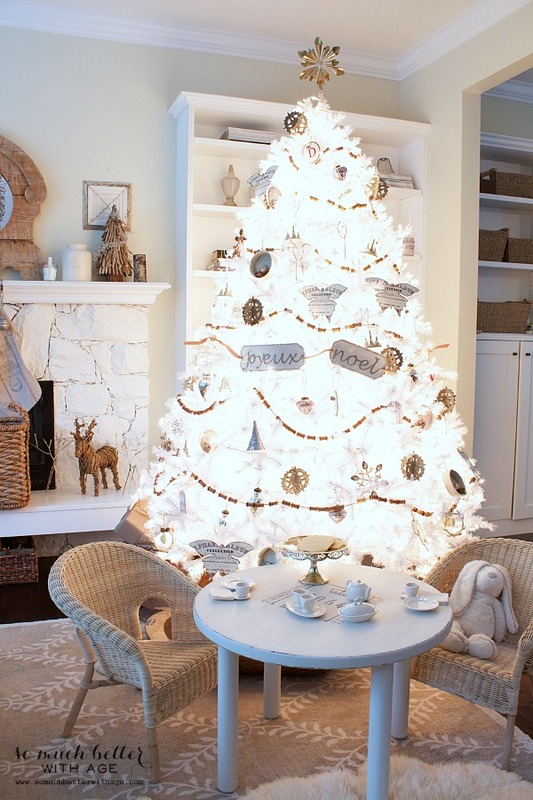 What a beautifully balanced tree that shows off your ornaments in a lovely way. It also doesn’t cover up with tree but accentuates the uniqueness of the ornaments tat you placed on the tree. There is a romance to your selection of ornaments that I think is so inviting. I have four daughters so I was “in” at the tea party table though too. 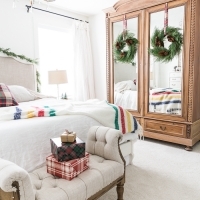 What a wonderful idea to use a completely white tree and have the neutrals in your ornaments reflect or repeat the natural element s in the mirror or wood piece on the fireplace as well as the baskets below. Soooo pleasing to the eye and such harmony to the room. You could definitely leave this up for a while after Christmas. It look as if its part of the room. Winter wonderful job. Thank you so much, Dagmar. I really loved decorating a white tree this year! It was so much fun and the tea party was fun too. Thank you so much for your sweet comment and kind words. its absolutely perfect Jamie. 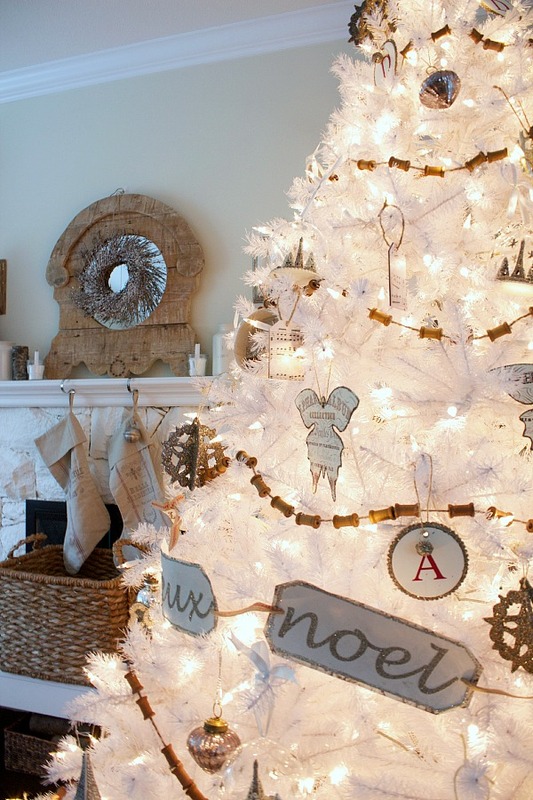 I love the white tree but your rustic and home made decorations are what really does it for me. 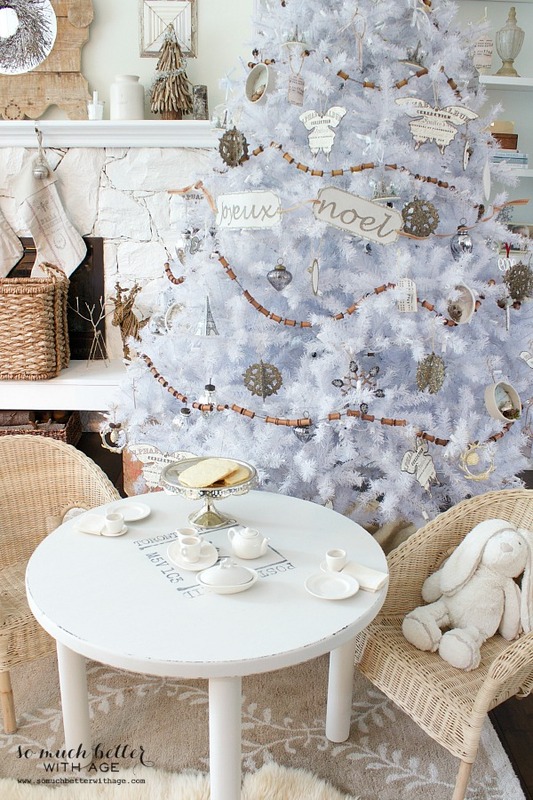 Its just a natural extension of your living room that it fits right in yet very festive and seasonal at the same time. You are such a talent! Awww, thank you so much, April. You’re too kind. So so stunning!! 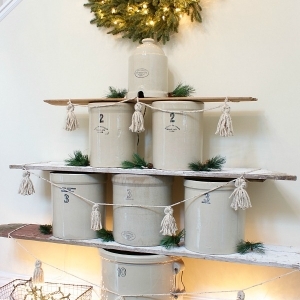 You did totally get your Christmas present early:) I would love to get a Balsam Hill tree!! SO pretty, Jamie! 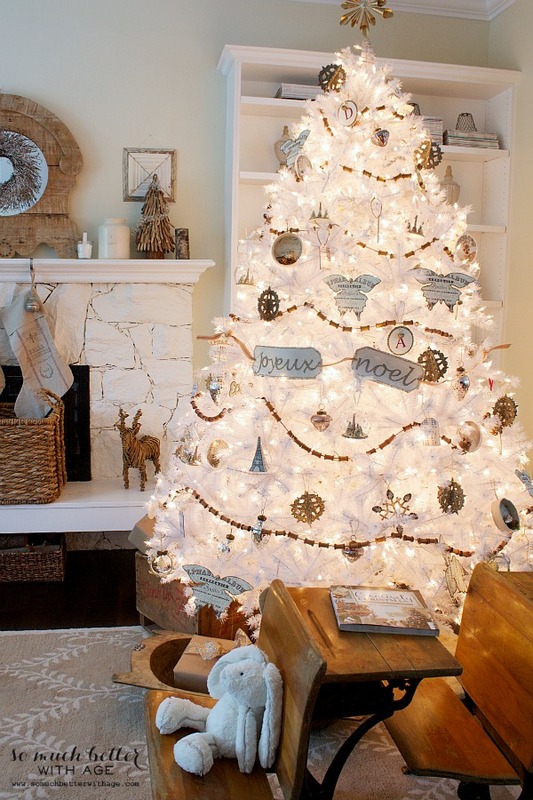 Love the wintery, white tree! Wow! Stunning! 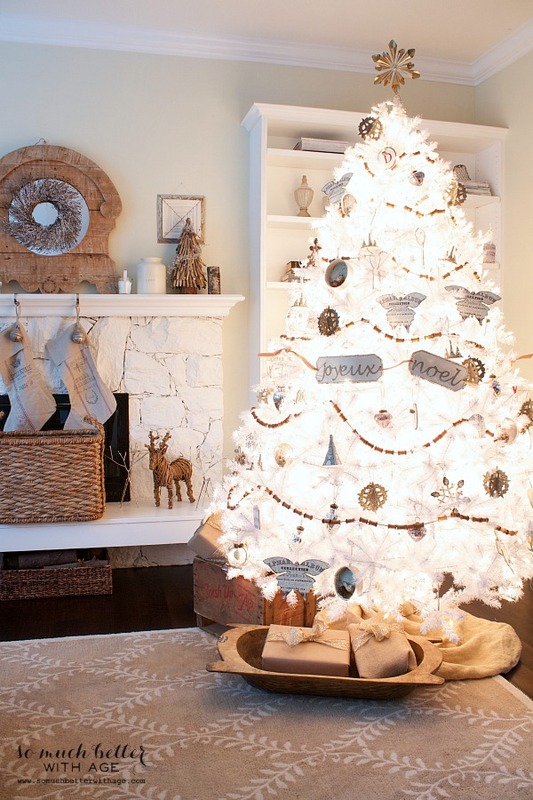 I never thought of a white tree before but now you make me want one! Love it lit up too. I Love that you get your white Christmas no matter what! Jamie, your tree is absolutely gorgeous! 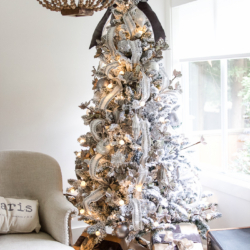 And I am smitten with the spool garland that you hung!! Oh. My. Ok, this tree is gorgeous when it isn’t lit up, but when those lights come on – its like a whole other level!! Beautiful! Absolutely breath-taking! Thank you so much for sharing it with us! That is one of the most beautiful trees I have ever seen, Jamie! It’s so YOU and just stunning!